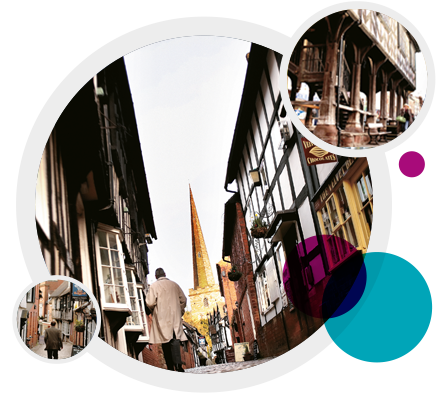 Sequani’s home is the historic market town of Ledbury; just a two hour drive west from London. Centrally located and close to the motorway network, it’s an hour to Birmingham in the north, Bristol in the south and Cardiff to the west. Closer to home are the cathedral cities of Gloucester, Hereford and Worcester. It’s said that Ledbury was built equidistant from the three cities so that their bishops could use the town as a central meeting place. Centuries later, the striking church is still a sought after destination and is frequently featured in films and on TV. Ledbury’s important commercial heritage through the ages is showcased by the town’s iconic original black and white market house which sits on stilts at the heart of the town. Today Ledbury is busy, urban centre which is key to the vibrancy and charm of its rural setting. The lively high street plays host to an array of independent retailers, cafes, hotels and restaurants. The town boasts successful teams competing for cricket, rugby and football trophies and every year in June fans of the written word head to Ledbury for the renowned poetry festival. Just 15 minutes away is the Festival Theatre in Malvern which frequently hosts pre-West End stage and musical productions. Further afield there are top-level concert venues in Birmingham, Cardiff and Bristol. Right on our doorstep is some of the most beautiful countryside the UK has to offer. The Malvern Hills are a short drive away and it’s less than an hour to the Forest of Dean and the Brecon Beacons. There’s no shortage of options to enjoy the outdoors whether you love walking, mountain biking, canoeing or just enjoying the spectacular views.